I’m pleased that you liked the poem! Inspiration gained from Robert Burns and Rupert Bear! Thanks for your more detailed explanation on collaberation, should I have realised that from your writing? I was never very good at interpretation in English at school. What is the governments purpose in introducing collaberation? Is it solely to produce more perfect humans or is there an environmental consideration. I was thinking that if 3 minds are sharing a body then 3 people are only using the same resources as one so that reduces the environmental footprint to 1/3. I’m hardly doing any running these days, I found that I was picking up injuries too easily so now do almost everything on a bike, it’s better for the aging legs I think. Glad to hear that you’ve really got into it though. 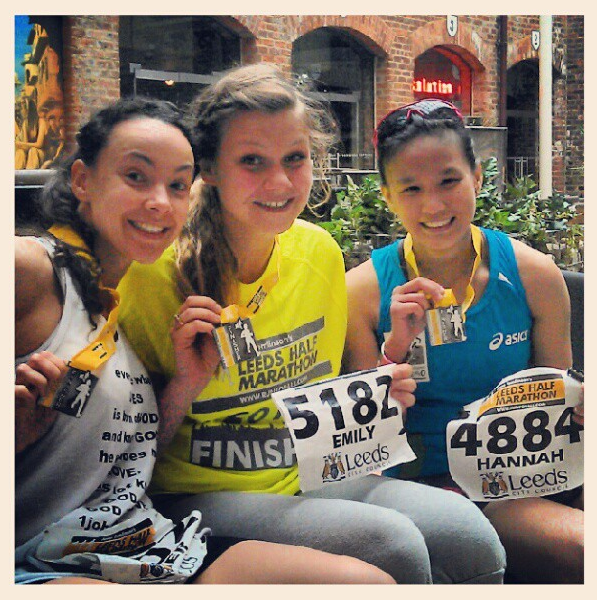 I liked the photo at the end of the Leeds 1/2 marathon. I hope that everything is going well for you in Vietnam. There is quite a bit of snow on the ground here so I’m not going on the bike this morning, I’ll head into the garage to do a session on the turbo trainer instead as soon as I have given the kids breakfast. Do you still use your g-mail address, I have a link to send you which you may be interested in.